Leave to Remain is being hailed as the next big British musical. 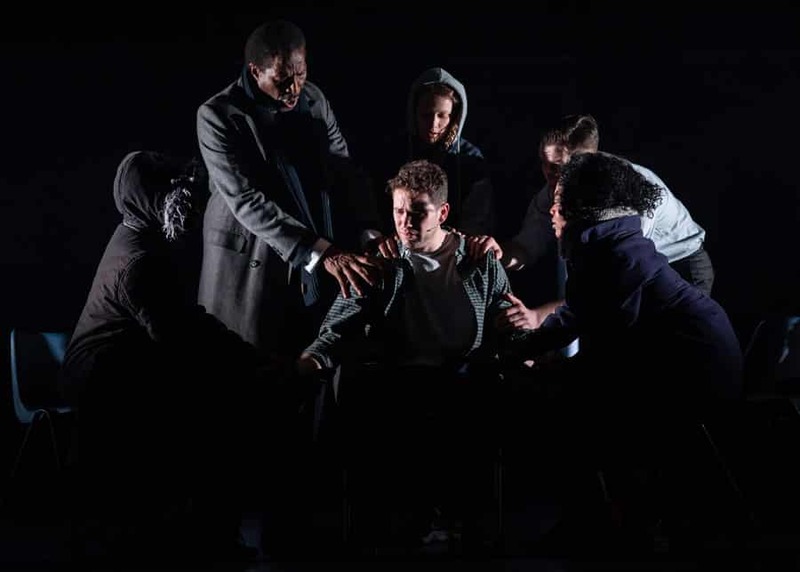 It’s currently in its debut season at the Lyric Hammersmith. The theme is contemporary, the music echoes African beats and harmonies beneath a steady dance club electronic vibe and the choreography is a blend of contemporary dance with hip hop. It’s a buzz and blends trending styles with panache. It begs the question as to whether it breaks new ground but that is an old question and why not enjoy the current styles before moving on to the next? The kernel of the story came from co-writer Kele Okereke who took his idea of a story about gay marriage to Matt Jones. The twist in the tale is that one of them isn’t sure. That happens in all marriages to some degree, straight and gay and for a myriad of reasons. The real depth of the story comes in the relationships in and between the two families. There are so many problems in each unit that it’s like watching a car crash, sometimes in slow motion. Despite the uncertainty of whether to marry or not to marry, one of the grooms needs a visa, the other has a secret and so this will be a marriage built on untruths on both sides. The gay friend who accompanied me and is engaged to be married voiced concerns about this and other clichéd scenarios that perpetuate stereotypes of gay life and undermine the relevance of gay relationships and marriage. Beyond the scene of drug and alcohol infused dance raves is a quieter and socially refined culture that deserves recognition. There could be enough drama in the family situations for a substantial narrative without the numerous added complications. 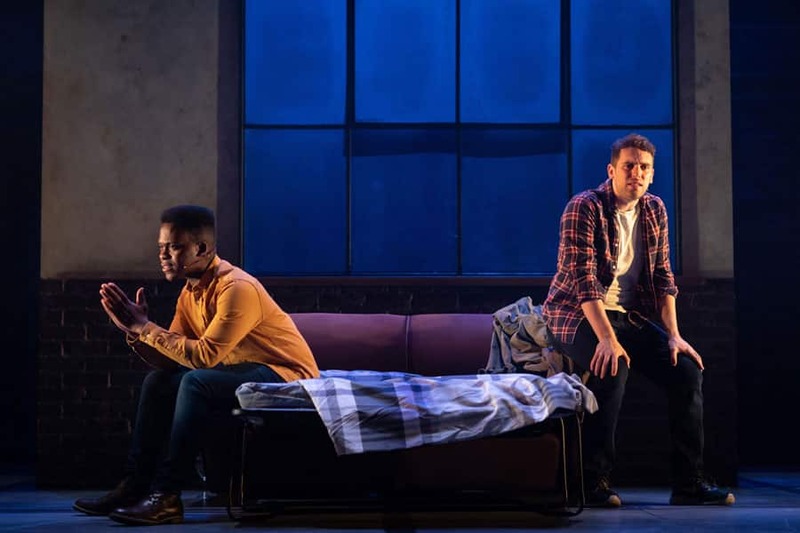 The show rocks through the exposition phase as Tyrone Huntley in the role of Obe and Billy Cullum as his partner Alex meet, fall in love and move in together. The pace builds to a wonderful climax in spoken word and a multi-layered musical interpretation of couple relationships. Alex and Obe, both sets of parents and their friends Raymond and Damien all speak The Lies We Tell. The characters speak individual phrases that are picked up by another and when the emotions run high the melody is added. It’s a very clever device to underscore the similarities and the differences in us all. Huntley has several stunning solo pieces as well as some highly dramatic scenes and shows great skill in delivering a believable and sympathetic character. Top of Form Cullum must wait for his solo, The Sea Between Us, which he delivers with conviction and strong vocals. The rest of the cast have individual characters as well as some minor bits. The women’s roles are all forceful and complex characters. 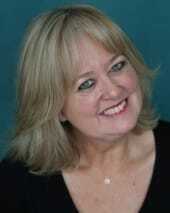 Johanne Murdock plays Diane, mother of Alex. Diane flies to London for the rushed wedding. It needs to be rushed in the face of Alex’s possible Brexit induced removal from Britain. Diane is not as strong as she appears and Murdock portrays this troubled mother with sympathy, finely underplaying the alcohol-induced vomiting of her truth. Murdock has the beginnings of what could have been a show-stopping number that starts to sizzle and stops too soon. Playing Obe’s mother Grace is experienced actor Rakie Ayola. 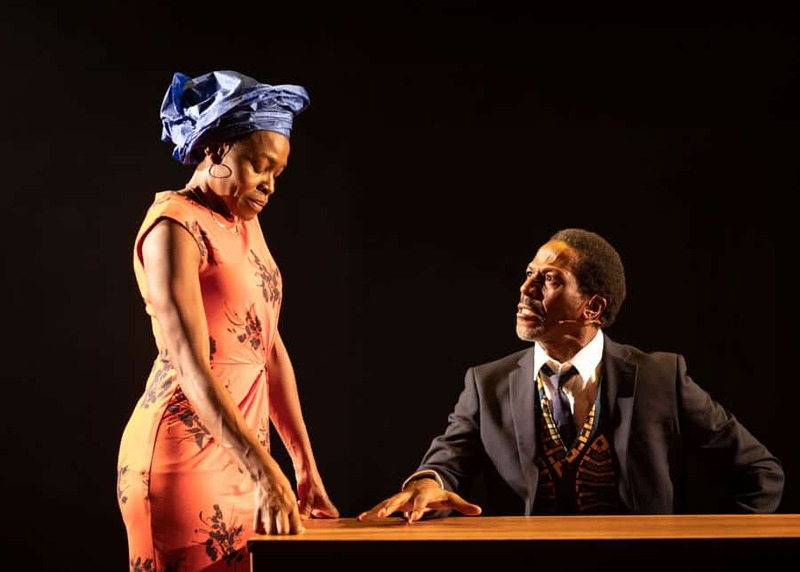 Grace has towed the patriarchal line and only in the final scenes of the show is she able to put words to the frustration of missing years of Obe’s life. She finally stands up for herself and her son in the triumphant final scenes. Ayole has a great singing voice and it would have been marvellous to hear more of it than this show offers. Aretha Ayeh is Obe’s sister Chichi, who is not the cutsie character behind that name but a hard-hitting successful lawyer and source of enduring support for her brother. Ayeh also delivers a powerful performance and grabs attention with her short solo singing spots. The overbearing patriarchal figure of William is given by Cornell S. John. His characterization as the implacable father of Obe, who disowns his 16-year-old son for being gay, is chillingly cold. The choreography in dance and stage movement is outstanding in this production and is the work of director Robby Graham (there being no further credit in the program and given Graham’s background in dance). The fluidity of movement is beautiful to see as are the more energetic and forceful numbers. The scenes where slow motion is used are very effective and break down the underlying torrent of emotions in the action. 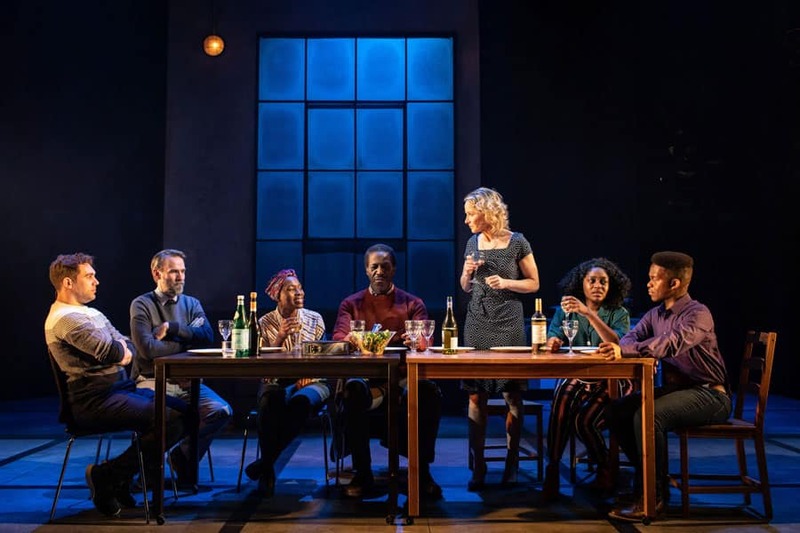 The set, designed by Rebecca Brower is often an integral part of the movement and the ensemble shift screens, carry chairs and dress the set in well rehearsed and choreographed sequences. It supports the narrative well and ensures the flow of the story proceeds smoothly. Playing on this set is the vibrant lighting of Cat Carter. 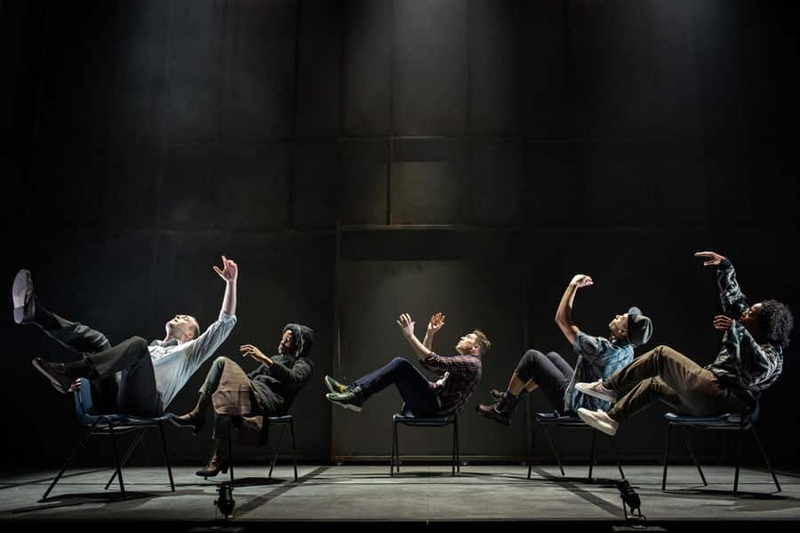 Leave to Remain is full of clever ideas and the cast crackles with an abundance of talent.